Installation view at the Judith & Norman Alix Art Gallery, 2012. Installation view (County Jail) at the Judith & Norman Alix Art Gallery, 2012. Installation view (School) at the Judith & Norman Alix Art Gallery, 2012. Detail of installation (School) at the Judith & Norman Alix Art Gallery, 2012. People assume that time is a strict progression of cause to effect, but actually from a non-linear, non-subjective viewpoint - it's more like a big ball of wibbly wobbly, time-y wimey, stuff. To view The Diversions, you must walk through one of two narrow hallways, both of which will deposit you in front of a 42” monitor and at an extreme angle to one of the two sets, the school or the jail. Upon entering you are channelled along the edge of the monitors into a space that opens between the two sets into an hourglass shape, providing just enough room to comfortably navigate the two major elements of the installation. The proximity of the two sets to one another and the configuration of the eight monitors make it almost impossible to consider one set in isolation. 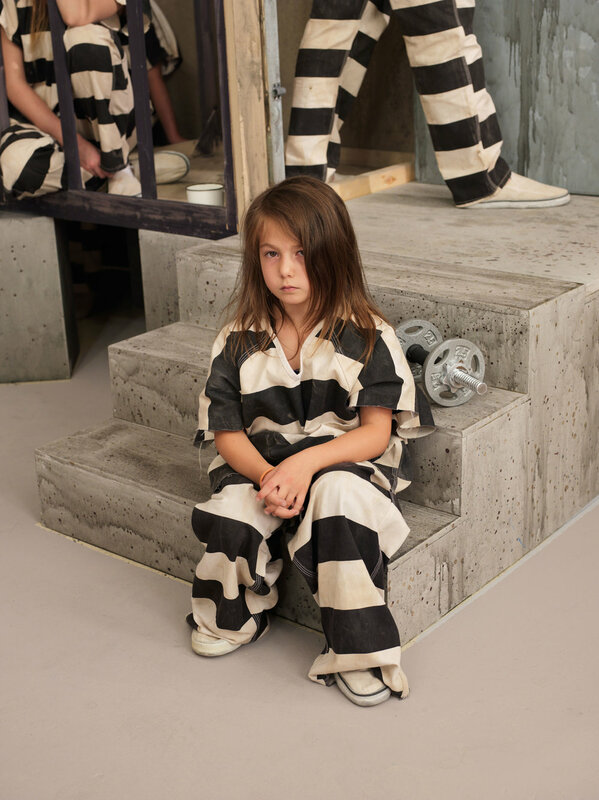 If you do find that spot, you will be able to see the jail through one of the windows painted on the backdrop of the school scene—there is no escape. You are, however, free to construct the narrative within the installation around you. It will inevitably be influenced by your location in the room, the pattern of your gaze around the room, and the random sequence of the videos playing independently of one another. Like a window into the past, each screen plays between three and five tableau vivant videos averaging between two and four minutes. Each is recorded from the specific angle from which its respective screen is hung. You will be gently nudged around the room as you attempt to line up the image on the monitor with the view of the set behind, only to discover that there are sweet spots in the space that will allow you to view all eight screens in a logical relationship to the set behind . . . until the video on one screen changes, and you subconsciously take a step back and to the right or left to once again create a logical narrative sequence. Typically, Hannah’s work either involves re-stagings or re-considerations of celebrated works from art history—as in the Prado Series (2008), The Burghers of Seoul (2006) and The Raft of the Medusa (100 Mile House) (2009)—or focuses on personal and social histories, as in Make-up (2003), Family Stills (2002-ongoing), Dad and David Visiting (2010) and, most recently, The Russians (2011). In The Diversions, we are brought face to face with both our personal and our social histories. Who, as a kid, hasn’t played School or Cops and Robbers? Chances are that most North Americans, regardless of where we live and to what generation we belong, know exactly how these games are played. In the game School, kids give themselves free rein to do everything they are normally forbidden to do—fight, tie up the teacher, light school books on fire, and draw on the blackboard. And in the Cops and Robbers’ version of Jail, while the bad guys come in the front door in handcuffs, prisoners are finding ways to escape out the other. In both scenarios, the human desire to break free of the imposed control of two of our most common disciplinary/social institutions is present. At its core The Diversions is a social piece with a desire to build a dialogue with its viewers. As such it can withstand multiple and prolonged visits. Each time you enter the installation, the narrative will change and your experience will be new. The possibility to discover something unfamiliar within the familiar increases the longer you spend in the space and with each return visit. The Diversions is a self-contained project that folds in on itself and integrates both the artwork and the production of the artwork. It bridges multiple mediums of artistic production: performance, photography, video, sculpture, installation and theatre. Working on multiple levels, The Diversions unapologetically engages its audience in a sophisticated web of postmodern, schizophrenic, temporally-displaced wibbly wobbly, time-y wimey, stuff. Curator and Director of the Judith & Norman Alix Art Gallery, Sarnia, Ontario. The artist wishes to extend a very special thank you to the community of Sarnia which helped bring this project to life in so many ways. 2012, Adad Hannah: The Diversions, The Judith & Norman Alix Art Gallery, Sarnia, Ontario. 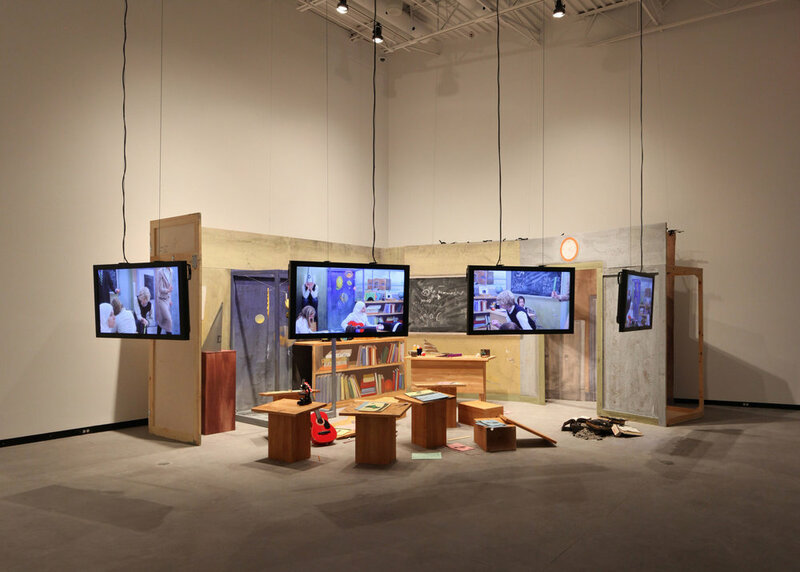 2013, Adad Hannah: Recent Works, Pierre-François Ouellette art contemporain, Montreal.